Who considers the Coalition ‘form’ in the last 24 hours to be ‘acceptable’? Wish I could be like an MP & not bothering to go to my desk to work as I feel I have more important things to do. If you missed it, see this “awe inspiring rant by Mr Richard Chirgwin” from last night in regard to the Coalition not bothering to turn up for the introduction of the DisabilityCare Bill, I suggest you do. I had hoped that our media would report this lack of respect to the disabled this morning, unfortunately, all they seem to be interested in is Mr Abbott’s Budget reply speech tonight. Speaking of which... Did you know that Mr Abbott’s reply speech to the budget is more important than a mother taking time off work to care for her sick baby? Well, yes it is, Michelle Rowland was not afforded the use of a “pair” member to fly home to care for 14 month old baby. Simon Benson has reported here: "Opposition blocks bid to be with sick baby". So let’s re-cap. 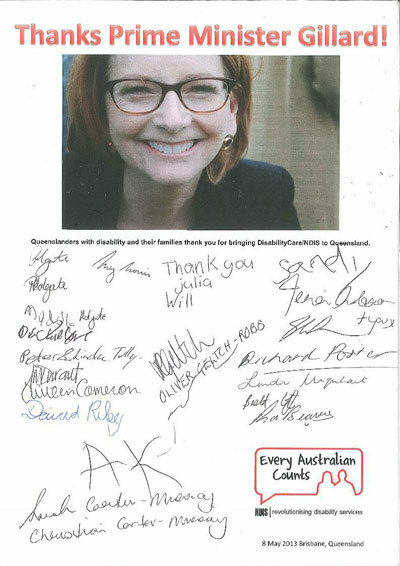 In one 24 hour period, our Coalition Opposition and soon to be ‘Rulers’ as the Australian media keep telling me (personally I would prefer to actually vote first, obviously that is an optional extra in our democracy), have insulted every disabled person in this country by not bothering to attend the Bill introduction. Now I am sure that by the time I have uploaded this ‘opinion’ piece that the Coalition will backtrack on Ms Rowland’s dilemma, there will be excuses of “Not being aware of the seriousness of the pairing request... blah blah” as they have the opportunity to backtrack. What the Coalition cannot backtrack on is their non-attendance in Parliament yesterday. Yes, a budget is important, but it happens every year, this historical Bill is a one-off. This should have been a day of celebration for the disabled, their families & their friends, a celebration of our Nation, shared by all! The relief for so many in this country, who live in fear that they will die and not be able to care for adult disabled children is more important than a budget response. The fact that a family with a disabled child will be able to move State to better their circumstances if the opportunity arises due to standard nation-wide care is more important than a budget response. The simple promise that carers of the many disabled in this country has some surety about the future of their families is more important than a budget response. It has been suggested this morning that the ‘No-Show’ is not really that big a deal as it has already been made clear that they would support it, so no biggy... I am sorry, but I disagree. Our MP’s are employed to represent US, the Australian people in the Electorates where they were priveledged enough to receive a vote of confidence from the ‘people’ that they would represent their interests to the best of their ability. Unless all these members that did not bother turning up for Parliament do not have any disabled in their electorates, I fail to see how that is representing your electorate? Mr Abbott will have nothing to offer in his Budget reply except to say “This is a bad Government”, “This Government can’t be trusted...” blah blah. You can guarantee that all of the Coalition will be there, bums on seats to cheer Mr Abbott on. The media in this country are already setting the stage for Mr Abbott’s wonderful reply speech, as it will be, just ask them. It has been the lead story on all the TV stations. Not one whimper about the total lack of respect afforded the disabled community yesterday, barely a mention of the decline of the pairing arrangement, though anyone want to take odds when they invariably backflip on that there will be plenty of airtime given to it? The producers of these News shows that decided the lack of support for this bill and blatant disrespect shown to the Disabled by the Coalition, was NOT News, should be thoroughly ashamed of themselves. If this is the state of our Nation, where our elected members of Parliament are allowed to behave in this manner and the media will just shrug off as a political ‘tactic’, it is not a Nation I want to be part of. I have discussed on this blog in the past my feelings about the ‘lack of empathy that Mr Abbott has shown in the past’ and the attitude displayed in the past 24 hours has not changed my opinion. The disabled I have spoken to are hurt & disappointed when they have discovered the no-show, worse, they are now worried that by not bothering to turn up, the Coalition in fact plan to wind back the NDIS as they don’t really support it... This is not the sort of worry that these people need, they have enough worry in their lives as it is. Politics and political gamesmanship should NEVER be more important than “PEOPLE”. No segment of our society should ever be disrespected the way they were yesterday in Parliament. No mother should ever have to stay away from their sick child to satisfy a political game. 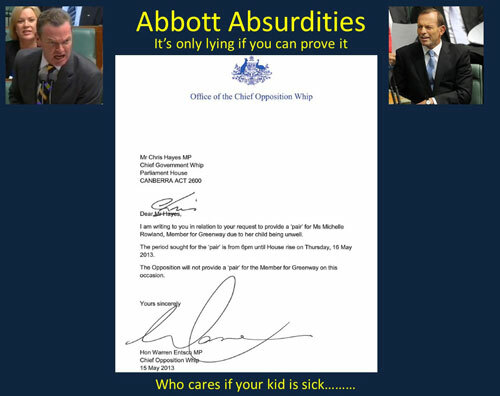 It is time for the media to scrutinise Mr Abbott. It is time for the media to show the sheer ambition and lengths that Mr Abbott will go to, just to gain power in this country. It is time for the media to let the Australian public know exactly how much Mr Abbott values them, as obviously, his political ambition is more important than we, the public, are. After working in very large companies, I fully comprehend that the ‘tone’ & ‘attitude’ of a company filters from that of the CEO at the top. Therefore this attitude can only be coming from Mr Abbott, having said that, it does not excuse the fact that the other Coalition members blithely followed instructions to not attend. You should all be ashamed of yourselves! IMPORTANT: 11.00am I guess I am psychic, all over TV about generous the Opposition are in allowing Ms Michelle Rowland to be paired... Mr Pyne waffled with rubbish saying "Did not know Ms Rowland's child was sick..." the whole debacle is best described in "MP's sick child furore: Abbott still doesn't get it, says PM" by Jonathan Swan. The talented people over at "Exposing Tony Abbott & The LNP - Memes & Stuff" also very quickly came up with a wonderful frame for the Warren Entsch letter of decline, see above, well done!